Chic resort town south of Coffs Harbour. Sawtell is a peaceful and increasingly fashionable coastal village which is both a retirement destination and a family holiday escape. It is technically a suburb of the City of Coffs Harbour and is bounded to the west by the railway line, to the north by Boambee Creek and to the south by Bonville Creek. The town's primary attractions for the visitor are the beach which lies between Boambee Head and Bonville Head, the two rocky promontories which are located beside the estuaries of Boambee Creek and Bonville Creek. Sawtell has a small, elegant shopping centre which is defined by a distinctive and quite tropical median strip. For the visitor there are panoramic lookouts from the two headlands, some pleasant walking areas near the river and the beach, a fine picnic area and playground near the mouth of Boambee Creek, good fishing in the creeks and the ocean, boat ramps at the two caravan and camping reserves, surfing, skin diving, an inviting saltwater tidal swimming pool at Bonville Head and safe swimming at Boambee Bay. It is an attractive alternative to buzz of Coffs Harbour. A quiet retreat with real class. Sawtell is located 526 km north-east of Sydney via the Pacific Highway. It is 26 m above sea-level. Sawtell is every developer's dream. In 1923 a developer named Oswald Sawtell subdivided the land and named the new development after himself. The town was officially gazetted as Sawtell in 1927. Sawtell Main Beach lies between two rocky headlands - Boambee Head to the north and Bonville Head to the south. The former looks over the estuary of Boambee Head and the latter over the Bonville Creek estuary. North of Boambee Creek is Boambee Beach and south of Bonville Creek is Bonville Beach. Sawtell Main Beach has a surf lifesaving club and a pleasant reserve above the beach. 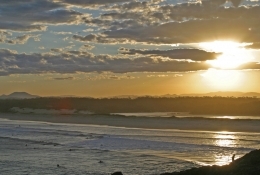 Sawtell Island, which lies at the south of Sawtell Main Beach, is a popular surfing location. There is excellent detail on all the beaches in the area at http://sawtellnsw.com.au/local-beaches. The Coffs Harbour Butterfly House is located at 5 Strouds Road, Bonville. The visitor can stroll amongst hundreds of Australian butterflies in an indoor subtropical rainforest settling. The Butterfly House also has a cafe, a maze and a gift shop. It is closed on Mondays and open from 9.00 am to 4.00 pm six days a week with the best viewing times being 10.00 am - 2.00 pm. tel: (02) 6653 4766 or check out http://www.butterflyhouse.com.au. 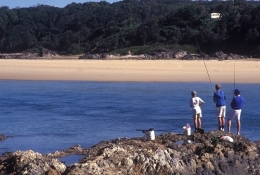 Lying immediately to the south of Sawtell, and edged by Bongil Beach, is the Bongil Bongil National Park, a quiet and peaceful destination which is ideal for fishing, bushwalking and barbecues. The park's main attractions include the 2 km Bluff Loop Walking Trail which begins and ends at Tuckers Rocks and reaches a lookout over Bundageree Creek. It passes through jungles of vines and palms and is home to a significant colony of koalas. The park's other main walks are Bundagaree Rainforest Walk (a 6 km loop which takes over 90 minutes which the National Parks website describes as: "With rainforest on one side of the dunes, including red olive berry, coastal banksias and staghorns, you're sure to see a variety of rainforest birds, including Lewin’s honeyeaters and satin bowerbirds. You might be lucky enough to catch a glimpse of a male satin bowerbird’s bower; two parallel walls of sticks that are then decorated with blue coloured objects with the aim of attracting a mate.") and the Bongil Beach walk. The beach is 7 km long and gloriously unspoilt. The National Parks website points out "Keep your eye on the waves, as you might see dolphins and, on shore along the dunes, the bright pink flowers of the succulent pigface are sure to catch your attention. Look out for shorebirds such as little terns, red-capped plover and pied oystercatchers scurrying across the sand." Check out http://www.nationalparks.nsw.gov.au/visit-a-park/parks/Bongil-Bongil-National-Park for more information. * Prior to the arrival of Europeans the Gumbainggir Aborigines lived in the area and hunted and fished on Bonville Creek. They knew the area as 'Bongol Bongol'. * In 1770 Captain James Cook sailed up the coast and passed the present site of Coffs Harbour. * It has been claimed that the first Europeans in the area were convict escapees who took refuge on offshore Muttonbird Island in 1791. * By the 1840s cedar cutters were in the hinterland. * In 1861 a surveyor named Greaves set aside 960 acres as Bonville Reserve. * In 1863 Walter Harvey reached Sawtell with a bullock team. He retrieved cedar logs which had been washed ashore on Sawtell Beach. He stayed on for the cedar and a small community emerged. * In 1871 William Bayldon selected land in the district which he called Boambi. * Around 1880 the Boambi property was bought by a Mr Lyon who started to use the property for holidays. * By 1907 the land where Sawtell now stands had been selected by John England. * Development was slow until 1923 when Oswald Sawtell subdivided the land. He had purchased it for £500. * The railway reached the area in 1925. * A post office opened in Sawtell in 1927. That same year the settlement was gazetted and a road opened to Coffs Harbour. * The first school was set up in 1928. * The Sawtell Hotel was licensed in 1932. The nearest visitor information is at Coffs Coast Visitor Information Centre, the Big Banana, 351 Pacific Highway, Coffs Harbour, tel: (02) 6648 4990. The Sawtell Chamber of Commerce website is located at http://sawtellnsw.com.au and has information about accommodation and eating. Fishing off the rocks opposite Bongil Beach which edges the Bongil Bongil National Park. Sawtell Memorial Rock Pool and the beach which edges the Bongil Bongil National Park. Surfing and fishing off the beach which edges the Bongil Bongil National Park. Sunset over Bongil Beach which edges the Bongil Bongil National Park.